Ann Wilson of Heart and Alice In Chains guitarist Jerry Cantrell delivered a tribute to the late Chris Cornell at the Rock And Roll Hall Of Fame Induction Ceremony in Cleveland, OH on April 14. The Seattle Times reports the pair performed a stripped-down version of Soundgarden’s 1994 classic, “Black Hole Sun”, at the event following an “In Memoriam” montage saluting Cornell and other fallen rockers from the past year, including AC/DC’s Malcolm Young, Tom Petty, Glen Campbell, Gregg Allman and Chester Bennington, among others. Both Wilson and Cantrell were friends of fellow Seattle music scene member Cornell, who took his own life in a Detroit hotel room last May at the age of 52. "Chris was a friend for many years, an incredible artist, a wonderful human being,” Cantrell told reporters in the Rock Hall press room backstage. “I’ve always been inspired by his work ethic and talent, and his band Soundgarden they were a big influence on us. It’s obviously very sad, I still don’t really know how to discuss it personally, but I think at this point it’s time to maybe focus on the type of man that he was, and the type of human being, and the type of artist. Incredible depth. "Our bands helped each other in the early days, we were all under the same roof with Susan Silver managing them, Kelly Curtis managing Mother Love Bone and then Pearl Jam, and they jointly managed us. We were all in the same law office over the central tavern, and that was the home base. I’m going to miss him immensely, but I also celebrate his life and his life’s work." As for his involvement in the tribute, the guitarist explained: "Ann called me and said she was thinking about doing something for our friend, and asked me if I would join her. Anytime she calls I’m there, and if it’s for Chris of course, absolutely." 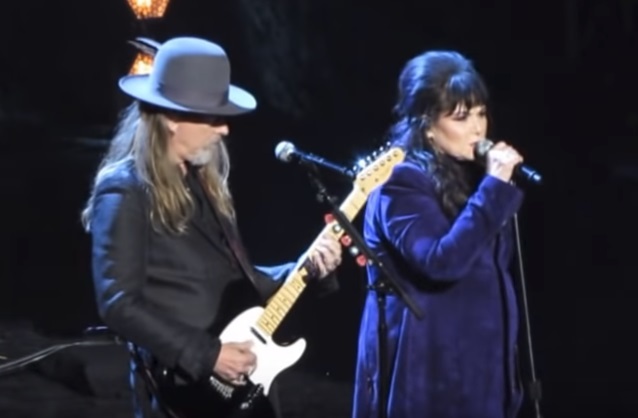 Cornell inducted Heart into the Rock Hall in 2013; the 2018 ceremony will be broadcast by HBO on Saturday, May 5 at 8 PM EDT.